The Liberty Head Nickel was the second five-cent nickel produced by the Mint. The first, the Shield nickel, had been designed in 1865 and 1866 by James B. Longacre. It had presented many production problems and had very difficult to strike successfully in the new alloy. In 1881 Mint Director Archibald Snowden ordered Chief Engraver Barber to create possible designs for new one-cent, three-cent, and five-cents coins. All three coins were to have simple, nearly identical designs — Lady Liberty and the date on the obverse, a wreath and the denomination on the reverse — that would make them easy to strike in copper and nickel. Barber created and fine-tuned the designs and then submitted them to Snowden. Snowden decided to abandon the one-cent and three-cent coins because he felt they were too small for people to handle comfortably, but he told Barber to continue work on the five-cent coin. Barber made a few more slight changes to the design which were approved by the Mint Director, and then twenty-five sample coins were struck. These sample coins were sent to Treasury Secretary Charles Folger for what was supposed to be routine approval. To everyone’s surprise, Folger did NOT approve the new coin. He pointed out a problem that nobody at the Mint had noticed — according to U.S. law, the words “United States of America” were required to appear on the REVERSE of the coin, not the OBVERSE as Snowden and Barber had laid it out. Snowden did not want to change the design and asked for an exception for this one coin, but Folger was adamant that the design needed to be changed. 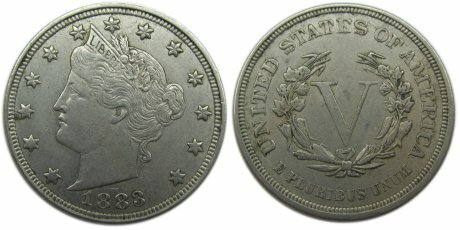 Barber moved the phrase to the reverse of the coin, adjusted the rest of his design to accomodate it, and had new sample coins struck. 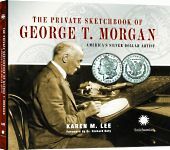 Folger approved the revised design quickly and the Liberty Head Nickel began production in 1883.